A couple years ago I stumbled across a photo similar to this one. I was blown away at the photographer’s ability to capture the scene so poetically. Like many other ideas that scurry across my brain I filed that mental image in my memory bank and waited for the day when I could pull it out. The rest of this post describes how I got the shot and what I learned along the way. It is my hope that you’ll find it helpful and will be inspired to take some rockin’ pictures yourself! First, a word to the skeptics: Yes. That is a real picture. I did use Photoshop to adjust the brightness, but other than that the image is untouched. I could show it to you on my camera. If you have any other questions, keep reading. After all, that’s why I’m writing this. Day 1. It had been raining all morning and slowly came to a stop around lunch time. I grabbed my camera and headed across the street to a patch of pansies. “This will be fun,” I thought. Let’s just say it started to feel like something less than fun as I spent roughly 90 minutes trying to get one shot. …trying unsuccessfully, that is. I came away with a few variations, but none were quite right. The main problem I encountered is that the pansies were too nondescript. They just looked like a blur of color when refracted in a water drop. Day 2. I decided to use tulips this time since they were a bit more recognizable. It was a bright sunny day, so I brought my fancy “Macro Mist Machine” otherwise known as a spray bottle. I kept spraying the flowers until the water drops collected and were big enough to be photographed. Ideally you want them as big and as perfectly round as possible. The more distorted the shape, the more distorted the refracted image will be. As I now realize it, the problem with my second attempt was that the tulips weren’t close enough to the water drops. Instead, the image in the drop is more of a landscape view. If you look very closely, you can actually see the Washington Monument in the first picture below. Also, I discovered (well after the fact) that I was actually zooming in too closely. In some cases I couldn’t even get the entire drop in focus because the Depth of Field (DoF) was too shallow. Zoom out a little; this will increase the sharpness by minimizing the DoF. You can crop the image later if you really want the subject bigger. It’s better to have a smaller subject in focus, than a larger subject out of focus. Day 3. I was definitely getting a bit frustrated at this point. I searched for some photos on Flickr to see how other people had pulled off the shot. Eventually my main problem became apparent: the drops I kept choosing were sitting on top of the petals, rather than hanging from a twig or something. The drops on top of the petals tend to be flatter, and much much harder to shoot from a decent angle. If you haven’t already come to this conclusion, I was lying on the ground at least 90% of the time. The images I found that “worked” all seemed to have the flower resting on the ground with the water drops slightly elevated so that the photographer could shoot down at them, rather than sideways as I was doing. To test this theory, I set up some random object around the apartment and tried to get a better feel for the spacing and position of everything. Depending on the size of the object in the background, it needs to be about two inches behind/below the drops. None of the pictures from attempt number three were satisfactory, but I finally felt like I knew what the problem was. Day 4. Determined to do it right this time, I headed out once more. After trying several variations with some dandelions I finally pulled it off by using a very small yellow flower (aka “weed”) and hanging dew drops on the grass. The last picture below is included to help give you an idea of just how small the scale is. Note the relative size of the nickel in the photo. The flower was placed less than two inches behind the drops, and the drops themselves are perhaps smaller than you would imagine. 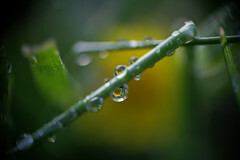 After taking several photos I sprayed more water on the grass hoping to enlarge the drops without making them too heavy. I snapped some more photos and repeated the process a couple more times before they fell. There are two main things to glean from my successful attempt. 1.) You really have to slow down and look very intently to find the right shot. 2.) Note that I placed the flower myself –I actually plucked it and then positioned it on the ground. Don’t be afraid to arrange the elements in the scene yourself. Chances are, you will have to be more hands-on than you might be used to if you want to have any success with this. Lessons Learned: Practice makes (almost) perfect. I didn’t successfully capture my water drop picture until my fourth trip out. I set out to capture a single image, yet I had to shoot over 500 photos before it happened. It was at times frustrating, “Why! can’t I get it right?” Patience and persistence are key. Don’t expect to get the perfect shot right away –excitement comes much earlier than satisfaction. Stick with it. Patience and persistence are key. Use an easily identifiable object for the subject you want to capture inside the drop. Don’t wait for the rain, bring your own! A spray bottle can work wonders. Don’t zoom in too close. The shallow focus becomes a problem the closer you get. Big, round drops produce the least distorted refractions. Hanging drops typically work better than sitting ones. The background object should be about three inches from the water drops. Take control and arrange the scene as necessary. Now grab a spray bottle and have at it! This entry was posted in Teaching, Tips and Tricks by Stephen Elliot. Bookmark the permalink. Great tutorial for someone trying to get the perfect reflection–thanks for sharing the info! Great tutorial. I have a 46mm macro zoom x 3 lens which I used to copy colour slides before, since this lens can only focus anything less than 1 inch in size my distance from the object is probably an inch, anything larger than one inch I can not focus at all so this is the disadvange of this lens. I never had any problems working our on the waterdrops at all. I have seen waterdrops shots taken with 100mm macro or reverse lens which I also have but they are not the powerful enough to see more details. I have a number of waterdrops shots in my photostream and you will notice that I did focus on the inside of the drops as they are the more challenging ones. I also took the photos handheld as there is no way you can get these shots with a tripod or monopod. They were mostly taken in my verandah garden. Macro shooting is a long passion of mine but the cost of the films were taking its toll due to the number of bad shots. It is only when I got my DSLR that I pursue this again not for commercial purpose but simply a hobby. I am a travel writer so I have thousands of photos from all over the world but they are not interesting enough to the Flickr viewers as there are so many others who can do the same. I am still working on my macro shooting and there are many opportunities to find out what you can see with this lens that the naked eyes could not see. So I can not say I am good at it, just trying my best and so far I am quite satisfied with the results but I need to improve more. SweetCapture, you are comment #100 on my blog. Lucky you! …well, that pretty much doesn’t mean anything, but hey, let me know if you’re ever in the D.C. area and I’ll buy you a cup of coffee or somethin’. Glad you like the tutorial. Wow, this is amazing. Thank you so much for sharing this! Will definitely try it out. It can most certainly be done. Stick with it! Excuses are for wimps. lol.thanks for encouragement…what should be the size of the object behind? i have arranged a drop on a flower on my kitchen counter..what size of object should i place behind? size of coin or it can be bigger? and as i am using the reverse lens technique for macro..i would be using autofocus? or can i use manual focus in that too? Nice photos. How close you were to the subject?